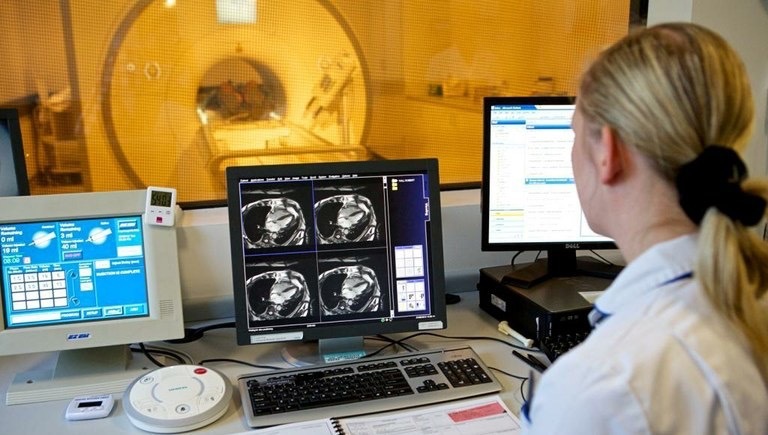 A dedicated research NIHR-funded 3T MRI scanner (Siemens Skyra), installed in 2011, which will be upgraded during 2018.Access to a 1.5T clinical cardiac scanner (Siemens Avanto). Access to a 1.5T clinical cardiac scanner (Siemens Avanto). To complement the scanners we have dedicated post-processing software with CVI42; Qmass; TomTec Feature Tracking and Siemens Syngo Via as well as in-house solutions. A 128 dual source CT scanner (Siemens Flash) and 64 slice CT.
Two SPECT scanners with ECG gating for cardiac scanning and a PET/CT scanner is being installed late 2017. A research 2-D/3-D transthoracic ultrasound system (Philips IE33) with integrated carotid/vascular scanning, state-of-the-art stress, strain and speckle tracking software. Scan analysis is available on-line (QLAB software) and off-line within the accompanying Xcelera reporting system. Access to further advanced imaging facilities, including Electron Microscopy is available through our links with Leicester Imaging Technologies (LITE).